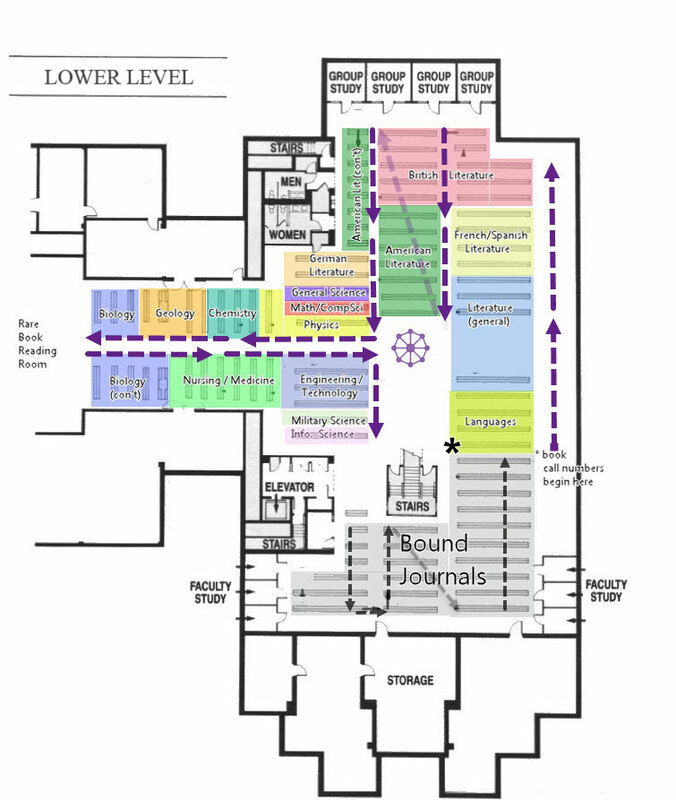 If you’ve visited our lower level this fall, you may have noticed some changes to the layout. Over the summer, we shifted the entire level so that the journals are now clustered together at the south end of the floor. Browsing the print books should be much easier without having to bypass long runs of journals. We are working toward separating the journals from the books on every floor of the library, and the fourth floor is now the only remaining level where the two types of materials are intermingled. 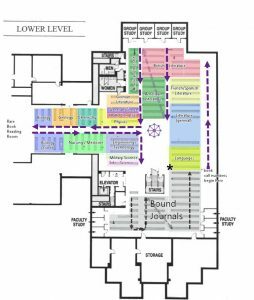 If you enter the lower level by way of the main staircase, the journals are on the shelves behind you. The print books start on the shelves immediately to your right with the “P” call numbers. The books continue around the north end of the level in a counterclockwise fashion, then loop out toward the Rare Book Room, and end near the elevator with the “Z” call numbers and the “OVERSIZE” books. Click on the annotated map to the right which shows the flow of call numbers as well as the location of books by subject area. The new subject labels on the end of each row of shelves, color coded according to this map, should also help you plot your course. Whenever you’re browsing by subject area, please remember that you’re only seeing about half of the books we have available! The other half are e-books that can be accessed via HopeCat or with the help of our Research Librarians. Previous Previous post: Check out our DVD collection!